Wednesday, February 5th, the eve of New York Fashion Week, which happened to be the day that two snowstorms hit New York City, Jack Spade also made its first ever appearance on the catwalk. And though the weather was ominous, fashionistas still flocked at the New York Public Library to witness this historic first for the label. Titled “The Art of Subtraction”, the Jack Spade Fall 2014 collection modernized American staples with a bias for simplicity, warmth and utility. The collection was inspired by the design philosophies of George Nakashima and Warton Eshrick, both of whom worked with wood and humble materials. They both created furniture and objects in there simplest form with a sense of the human hand. 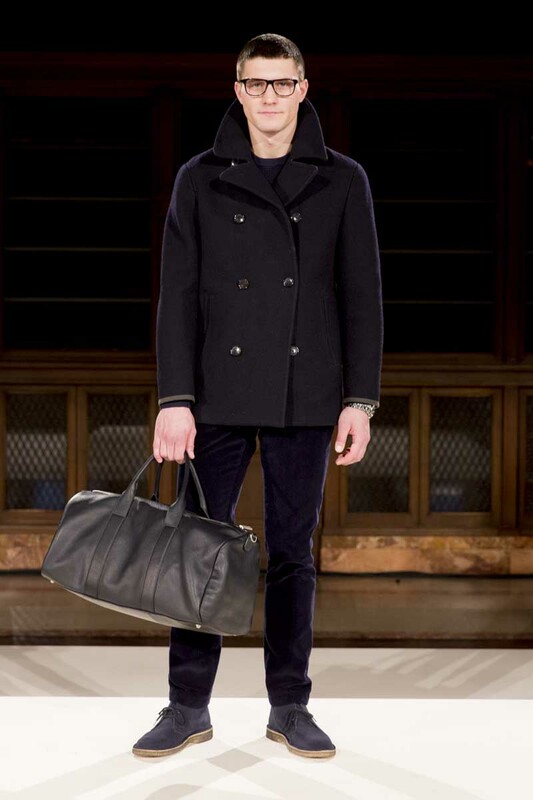 Jack Spade took the same approach and cut everything in classic fabrics and familiar silhouettes. The brand stripped away unnecessary details and, instead, focused on function and utility in both the bags and apparel with a few moments of levity in soft goods and styling. Even though the brand did away with frivolous detail this season, much was added to the collection as well, including an expertly tailored suiting collection. Never a brand to be too serious about anything, Jack Spade did manage to keep its cheekiness, pairing sleek jackets with quirky suede, signaling a fun, yet stylish new direction for the collection.